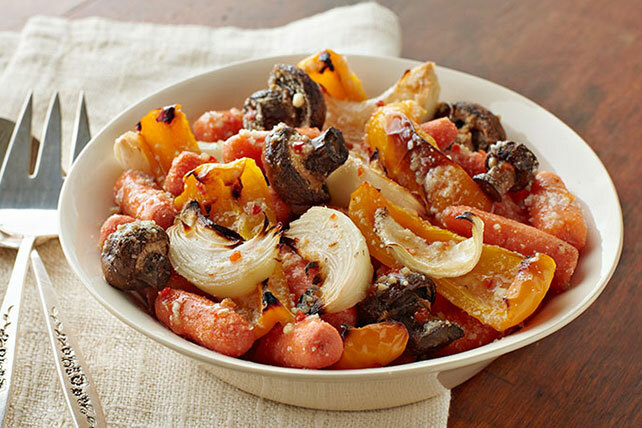 The garden-fresh roasted vegetables in this tasty side dish get a boost of flavor from both the Italian dressing and Parmesan cheese. Cover rimmed baking sheet with Reynolds Wrap® Aluminum Foil; spray with cooking spray. Toss vegetables with dressing and 1/4 cup cheese; spread onto prepared baking sheet. Bake 28 to 30 min. or until vegetables are tender, stirring after 15 min. Sprinkle with remaining cheese. Prepare using crimini mushrooms, and/or a green or red pepper.